Last week I received an invitation from Ananda Kesler to the official opening of her art exhibit, “Longing for Another Realm,” at the Art Center of Burlington. I passed it on to my friend Bob Saar who writes for The Hawk Eye, and introduced them via email. Intrigued, Bob went to the Art Center to interview Ananda as she was putting up her paintings for the show. They shared a deep conversation and he wrote an amazing piece for the newspaper. Titled “Abstract art as meditation in action,” it made the cover of the WEEKEND Section C1, Thursday, July 5, 2018. Bob was kind enough to put it together in a PDF for us to share. I know the print is small, but if you can expand your page (command and shift +), the text will become easier to read. Bob discovers Ananda’s eclectic upbringing, starting in Israel and immigrating with her family to Fairfield, Iowa when she was 12 years old. She told him about her education. Ananda attended MSAE, started college at MUM, then switched to U of I where she graduated with a BFA. She continued her studies in art and textiles at various art schools in California, Thailand, and Italy. Her work has been featured in many shows and articles. I like how Bob set up the topic of control in life and in painting, and how Ananda’s approach is the opposite. This idea illuminates her practice. Towards the end of the article she explains: “I practice painting as a kind of meditation in action,” from which he derived the title for the article. Enjoy this brilliantly written and insightful article. KBUR also interviewed Ananda Kesler. See Dive into Another Realm. Ananda’s description of her process, and the difference between feelings expressed in art, which are pre-verbal, and words, remind me of an experience I had during an intuitive art class I had taken years ago in Vancouver, Canada. See ArtWords—poem about a creative awakening. A related topic, on the difference between words and art, is played out in the movie, Words and Pictures. The story, set in a New England prep school, was actually shot at St. George’s School, an independent boarding and day university-preparatory school for boys in Vancouver, British Columbia, Canada, a.k.a., Hollywood North. A poem, Who Are You?, is central to the film. I posted it, with the movie trailer, and a magical coincidence told by an English teacher from that school on a radio talk show I had heard while living there. See A poem in a movie inviting you to be who you are, to find out the connection, and what famous actor he meets while walking in the woods during a lunch break. Each week, The Hawk Eye, Iowa’s oldest newspaper based in Burlington, focuses on an Iowan who is making a difference in the world. Bob Saar, a great storyteller of other people’s stories, came to Fairfield earlier this month to interview Leslee Goldstein about her TM study empowering disadvantaged Ugandan mothers. The Hawk Eye published his article on Sunday, May 20, 2018. I cropped this photo taken by Bob for The Hawk Eye. The caption reads: Leslee Goldstein at her home near Fairfield. The Detroit area native came to Iowa in 1975 to study Transcendental Meditation, and went on to earn a doctorate in Vedic science. Her research is in the area of using TM to address stress and improve learning opportunities among women in poverty. To read this well-written, comprehensive personal profile in their 52 Faces section, click on the title to go to the website where you’ll also see a gallery with 5 photos: Road to Africa is paved with good intentions. You’ll enjoy reading this inspiring heartfelt story. It’s also available in this PDF without the photos. KTVO had also reported on the study: Maharishi University researcher Leslee Goldstein studies benefits of Transcendental Meditation on impoverished Ugandan women — news report. ENJOY TM NEWS reproduced The Hawk Eye article with additional photos and a video made on Leslee’s study by her daughter Alena Goldstein: Empowerment from Within for Mothers in Africa. 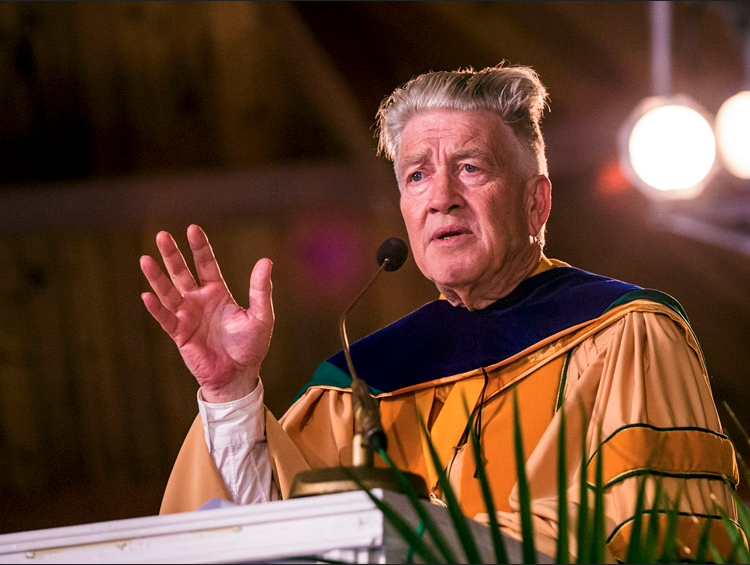 During their 2016 commencement ceremony on June 18th, 2016, Maharishi University of Management was proud to feature world-renowned filmmaker David Lynch, who was presented with a Doctor of World Peace honoris causa degree. Instead of a traditional graduation speech, Mr. Lynch held a spontaneous Q and A session with students about life-oriented topics that commencement speakers traditionally address. Here is that lively interactive commencement address. (19:37). Here is a transcript of the David Lynch 2016 MUM Commencement Q&A. See The 5 Best Quotes from David Lynch’s Commencement Q&A. Behind David Lynch’s Success | Consciousness-Based Education | What Makes a Meaningful Life | Graduates’ Roles for World Peace | What Makes a Good Leader | Falling in Love with an Idea | Following Your Intuition | Filmmaker’s Secret. Maharishi University of Management (MUM) in Fairfield, IA is a private university featuring Consciousness-Based℠ Education. The accredited traditional curriculum offers bachelor’s, master’s, and doctoral degrees in the arts, sciences, humanities, and business, but also integrates self-development programs. Innovative aspects include the Transcendental Meditation® program, one course at a time, and organic vegetarian meals. Visitors Weekends are held throughout the year. For more information, call the Admissions Office at 800-369-6480 or visit http://www.mum.edu. Physicist John Hagelin named new president as Bevan Morris steps down. FAIRFIELD — The 41st commencement ceremony at Maharishi University of Management in Fairfield began with hundreds of graduates and their family and friends filling the Golden Dome with “America, the Beautiful” backed by the Metropolitan Brass Quintet of Des Moines. The fact people from 53 countries were in the room participating gives one hope the mission of MUM and its representatives could be viable: world peace. “If there’s anyplace on this globe where nations are truly united, that place is here,” said MUM executive vice president Craig Pearson. Among the 366 students receiving degrees Saturday, 42 Ethiopians and 41 Chinese were outnumbered only by American students. Nepal, Egypt and Bangladesh had hefty handfuls of graduates as well, including a father-and-son pair of co-grads from Cambodia. Retiring MUM president Bevan Morris, along with his named successor, world-renowned physicist John Hagelin, presented keynote speaker and filmmaker David Lynch with an honorary Doctorate of Peace for his life work seeking to unite people around the world. Morris listed many of Lynch’s accolades, including four Academy Award nominations, four Golden Globe nominations, Best Director award from seven film societies, the Golden Palm at the Cannes Film Festival in France — the list goes on. Lynch’s landmark ABC-TV series that ran 1990-91, “Twin Peaks,” garnered 18 Emmy nominations in its first two — and only — seasons. And, of course, someone’s cellphone clarioned during Lynch’s introduction. No one minded it any more than they minded the small flock of children chirping at the back of the Dome, having fun on the bouncy meditational mattresses that replaced stiff, rigid stacking chairs. Lynch, with a hard-earned reputation for quirkiness and individual thought, dispensed with a speech in favor of a question-and-answer session with four graduating students who joined him on stage. “I did not do all those things they mentioned earlier,” Lynch quipped. Q: How do we reconcile having a job without a purpose in life? Lynch: Chances are you will find work you love. Q: What’s one thing you learned on your film sets? Lynch: Always have the final cut. Q: Can you tell us a moment when you fell in love with an idea? Ah, but the people in the Golden Dome did not agree, and David Lynch took his seat to a standing ovation. The students who received diplomas Saturday not only know they exist, they know what they’re going to do next. Whatever they do, it’s going to be good. Here is a PDF of what the article looks like in the Sunday issue of The Hawk Eye: Filmmaker David Lynch gives MUM commencement address in Fairfield. Fairfield, Iowa: Internationally-acclaimed author and lecturer Marianne Williamson will visit Fairfield, Iowa to speak on Consciousness, Democracy and Politics (In Support of Bernie Sanders), Wednesday, October 28, 7:30 p.m. at the Sondheim Center. Fairfield Mayor Ed Malloy will introduce Ms. Williamson. Marianne Williamson has spoken for years on the significance of spirituality as a moving force in personal and social change. She has been a popular guest on television programs such as Oprah, Larry King Live, Good Morning America and Charlie Rose. Six of her eleven published books have been New York Times Best Sellers, four of them reaching #1. Marianne’s first book, A Return To Love, is considered a must-read of modern spirituality. A paragraph from that book beginning “Our deepest fear is not that we are inadequate. Our deepest fear is that we are powerful beyond measure…” is considered an anthem by a contemporary generation of seekers. This year, she dove further into the political field in support of US Senator Bernie Sanders’ presidential campaign. Ms. Williamson has a long history of translating her ideals into action. In 1989, Williamson founded Project Angel Food, a meals-on-wheels program that serves home-bound people with AIDS in the Los Angeles area. Today, the program serves over 1,000 people daily. She also co-founded the Peace Alliance, a nonprofit that works on domestic and international peace building. And she serves on the Board of Directors of the RESULTS organization, working to end the worst ravages of hunger and poverty throughout the world. Her upcoming talk in Fairfield was forged from 30 years of experience and all the knowledge contained in her bestselling books, translated into front-line, on-the-ground action in the field. For anyone who believes that consciousness can keep good company with politics, no matter who is running or who is elected, Marianne Williamson carries illuminating perspectives into the conversation. Ms. Williamson will take questions from the audience after her presentation at the Sondheim Center for the Performing Arts. 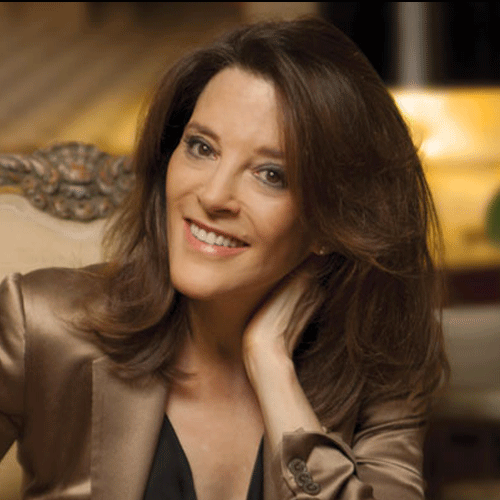 Read the Fairfield Weekly Reader’s Q&A with Marianne Williamson. Check out the interview Dennis Raimondi and Philip Goldberg did with Marianne Williamson on their new online program, Spirit Matters: Conversations on Contemperary Spirituality. Listen to this Spirit Matters Talk, and others, at www.spiritmatterstalk.com. Read and listen to Matt Kelley’s interview with Marianne Williamson on Radio Iowa or click on Self help author visits Iowa to talk about politics. Read Bob Saar’s interview with Marianne Williamson in The Hawk Eye. Event organizer Michael Sternfeld wrote a followup piece for the November 12, 2015 issue of the Fairfield Weekly Reader: Marianne Williamson—Force of Nature: A Personal Review, parts one + two. Sunday, November 20, 2015, 3 p.m., there will be a replay of Marianne Williamson’s talk at the Fairfield Public Library. Still missed the talk? You can watch it now on YouTube. Marianne also posted it on her Facebook page. Editor’s note: Some of my readers may find this post offensive, depending on their political allegiances, and because they usually expect articles related primarily to Transcendental Meditation. I myself am not a political person, nor do I wish to promote any candidates, especially since I am a Canadian living in the USA. I just volunteered to contact the press to help publicize this event, and since there was no where to link to the press release at the time, I posted it on my blog. I was told Marianne Williamson practices TM and is looking forward to coming to Fairfield where so many meditators are dedicated to uplifting consciousness for themselves and the nation. I am curious to see what she has to say about the topic—how consciousness, democracy and politics may be interrelated. This was one of many profoundly wise things Jim Carrey told the graduating class of 2014 at Maharishi University of Management in Fairfield, Iowa on Saturday. He was referencing his father’s choice in life, who could have been a great comedian, but chose instead to play it safe and become an accountant, thinking it would be a secure profession. But after several years he lost his job and the family had to do what they could to survive. In Jim’s case that meant leaving school to work at something he didn’t like to help support the family. But he also realized his father’s humor and love made people laugh, feel happy and forget about their cares. He soon realized he wanted to do that too and decided to become a comedian to make people forget their concerns. And he certainly succeeded beyond his wildest dreams! Gazette writer, Diana Nollen, attended the MUM Graduation and heard Jim Carrey deliver his amazingly funny and deeply insightful Commencement speech. Earlier, during his introductory remarks, President Bevan Morris mentioned Judd Apatow’s story of opening for Jim Carrey in his early days, and after seeing Jim perform, decided to quit standup comedy. He said Jim is the number one funniest person on the planet. It was the best opening line to a valedictory speech, following the best commencement address ever. Both were delivered Saturday at Maharishi University of Management, where about 1,000 people filled every chair and space in the Golden Dome to see 285 students from 54 countries receive bachelor’s, master’s or doctoral degrees — and to hear what the veteran Hollywood funnyman would have to say. Everyone, including Carrey, laughed at valedictorian Donna Marie Jones’ opening line. The mathematics major had the unenviable task of following Carrey at the microphone. Read more: Jim Carrey wise beyond his wiseguy ways: Hollywood funnyman gives commencement address in Fairfield. 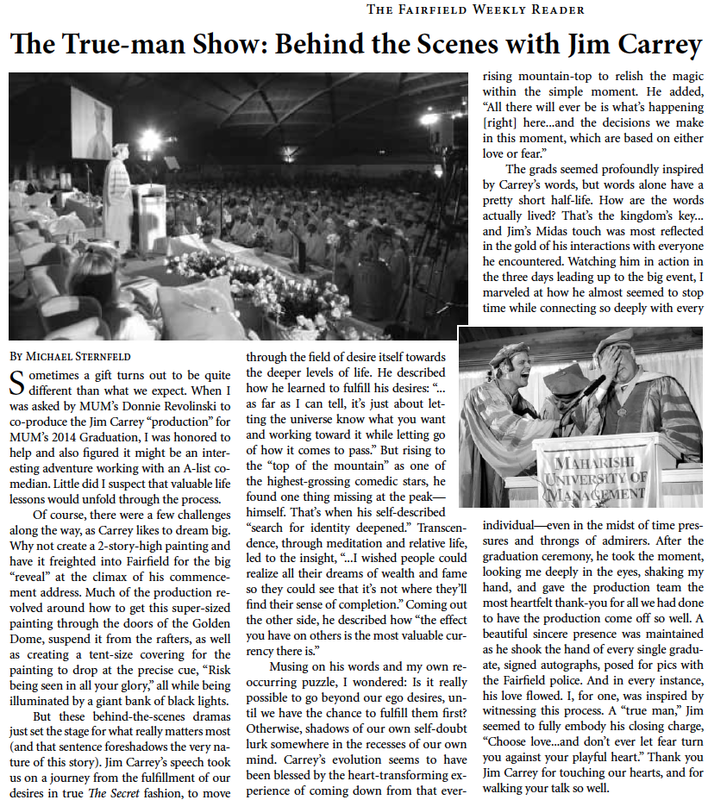 Sunday’s Hawk Eye cover story on Jim Carrey delivering the commencement address at Maharishi University in Fairfield was written by Bob Saar. He captured the joyful mood of Carrey’s wit and wisdom as he delivered a funny yet deeply powerful message of insight and encouragement to the graduates. Dr. Carrey (he received a doctorate in Fine Arts) touched the hearts and minds of the over 1000 people there in the dome with his understanding, humility and humor. Brilliant! To read this article, just click on it once, and then again after it opens larger. Other articles are available below as well. Other Iowa media that reported on the MUM 2014 Graduation with Jim Carrey are: The Des Moines Register, Jim Carrey mixes laughs with advice at Iowa college graduation; The Gazette/KCRG, Jim Carrey wise beyond his wise guy ways, which is another excellent article, but with a slideshow and voice-over; The Fairfield Ledger: Carrey infuses graduation speech with humor; The Iowa Source article with photos and quotes: Jim Carrey Gives Heartfelt, Laugh-Filled Commencement Speech; and The Fairfield Weekly Reader for a personal glimpse from Michael Sternfeld of what it was like to see Jim Carrey work with the MUM and DLF crew to get his presentation in place: The True-man Show: Behind the Scenes with Jim Carrey. Michael Sternfeld later had a longer version of this article published as a cover story in Australia’s largest holistic magazine, Living Now, on pages 12+13, with a mention by the editor in the middle of page 3: http://bit.ly/1rmUTXE. National news coverage was by The Hollywood Reporter: Jim Carrey Delivers Commencement Speech, Receives Honorary Doctorate, NY Daily News: Jim Carrey gives emotional commencement speech at Maharishi University of Management, CNN: Jim Carrey’s inspiring commencement speech, USA TODAY: Hear what advice Jim Carrey has for college graduates; The Wrap: Jim Carrey’s Commencement Speech Warns Students of His Own Father’s Failure (Video); Time: Jim Carrey’s Commencement Speech Warns Against Playing It Safe; and many TV news shows like Today: Jim Carrey delivers life lessons in commencement speech, Good Morning America: Jim Carrey Reveals His Father’s Failure Inspired His Comedic Dreams; PEOPLE Magazine, June 9, 2014, page 8, under StarTracks; and many major publications running the story. WPTV 5 included a comprehensive review of highlights from various media in the Newsy report: Jim Carrey Maharishi University of Management graduation speech; Tells graduates don’t fail at what you don’t want. The international press ran the news all over the place. The Hindu later came out with, Choose between fear and love, including many highlights from Jim’s inspiring talk. Also visit the TM Blog for some more good quotes: Jim Carrey in Iowa? University Featuring Transcendental Meditation Scores Big with Commencement Speaker. KTVO posted two reports: Jim Carrey Gives Memorable Speech at MUM Graduation and Inaugural David Lynch MA in Film class graduates. Visit http://filmschool.mum.edu to submit your work for a chance at a scholarship. Here is a sample of the highlights on a b-roll sent to the media. 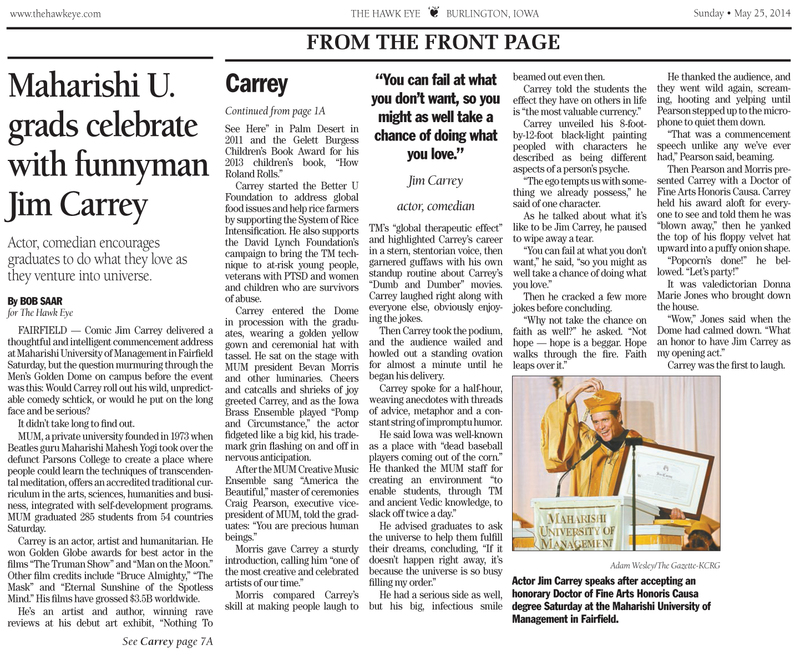 It is included in the Washington Post article: Jim Carrey gives commencement speech at Maharishi University of Management, which seems to be one of the best articles so far. And CNN just posted a second news report: Carrey Gets Serious at Graduation, Says His Dad Paved The Way For Him. The news anchor was surprised at how serious he was and what he shared with the MUM graduates: “That’s Jim Carrey. Wow! Jim Carrey told the crowed that he got into comedy to free people from concern.” More to come. This just in: Paresh David of The LA Times just published Could these be the best commencement speeches of 2014? and Jim’s address is 7th in the top 10! This is followed by TakePart, which listed quotes from Jim Carrey’s commencement address 2nd out of the top 6 commencement speech quotes of 2014: Six Commencement Speech Quotes That Got It Perfectly Right. Jim’s was listed after Colin Powell’s! MUM has now posted a report with this video and photos at https://www.mum.edu/whats-happening/graduation-2014. From there you can also access Jim Carrey’s Commencement Address, his honorary degree award, as well as the Valedictorian and Salutatorian Addresses here. See MUM Valedictorian Shines Alongside Jim Carrey. See some Videos of MUM 2014 Graduation with Jim Carrey. Six months later, Jim Carrey appeared on Ellen. She asked him about his giving a commencement speech, and to date, over 60 million people worldwide have seen Jim’s inspiring talk. This Burlington Hawk Eye article was picked up by NewsBlaze. Rocker James McCartney played his U.S. debut last night at Fairfield’s new Sondheim Center. The two shows were part of the David Lynch Foundation’s fourth annual “Change Begins Within” weekend at Maharishi University. McCartney, son of Beatle Paul, opened a three-ring musical circus that included Iowan Laura Dawn and folk legend Donovan. The audience, heavily weighted with aging ’60s boomers, went wild when the 32-year-old singer/guitarist walked on stage with Light, his band. The four-piece slammed right into their first number as a video crew taped the show for the DLF Web site. McCartney’s’ music was racy and frenetic, and the 400-plus seat Sondheim has well-designed acoustics that allowed the amps-on-stage rock band to deliver without overwhelming. James looks a bit like Paul with a shaved head. Ah, those eyes. He is not left-handed, and he played a Fender Stratocaster given to him by Carl Perkins. His voice was high and clear like his father’s, but at times, he sounded more like John Lennon when roughing things up. “James has a way with melody and a set of pipes which are more than a match for his dad’s,” Lynch said. Every song charged ahead with strange melodies flavored with grunge, perhaps like Nirvana covering side two of Abbey Road, backed by the Ramones. McCartney was stoic, mumbling only song titles between songs. Laura Dawn and her New York blues-rock band Little Death came out blazing away and had the audience on its feet and dancing before their first song was 12 bars deep. Dawn, a native of Pleasantville, is a stunning vocalist at the wheel of a powerhouse. She’s somewhat like Janice Joplin before the booze and cigarettes, or perhaps Martina McBride after a night of heavy pubcrawling. Little Death and their sweetly trashed-out backup duo – the Death Threats – blasted the audience into happy submission, a road-and-bar band with a refined stage presence. 1960s legend Donovan closed the show with a set of hits, from “Catch the Wind” to “Sunshine Superman,” delivered in his trademark quavering voice. 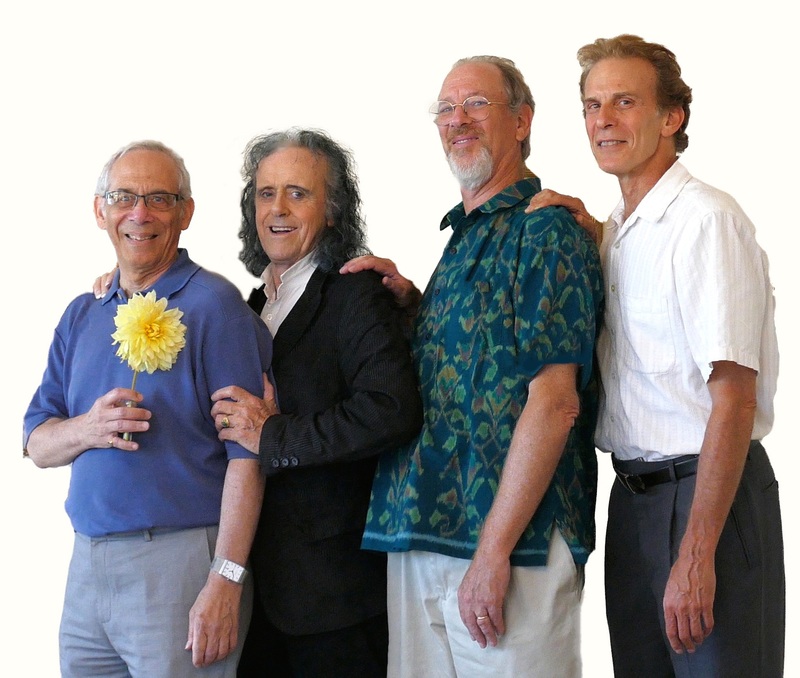 Donovan, along with the Beatles and the Beach Boys, brought Transcendental Meditation out of India into Western thought, which ultimately brought Fairfield to the forefront of the practice. Little Death and the redressed and fully sequined Death Threats backed the folksinger for most of his set. The finale featured the entire cast, including McCartney, singing “Mellow Yellow” with Donovan and the crowd. After the show, someone asked McCartney if he enjoyed playing in Iowa. *WOW! Saar nailed it-every part of it! And the second set was even livelier. Donovan invited Fairfield guitarist Arthur Lee Land on stage for his last two finales, that had Dawn’s husband, lead guitarist Daron Murphy, trading solos with Lee Land, leading to a coherent close, which brought the audience to its feet. What a night! Thank you David Lynch and Fairfield!! Other news coverage: McCartney wins over Fairfield audience in U.S. debut concert and Paul McCartney’s son says he’s ready to follow in dad’s footsteps. A few years later James McCartney sings Angel on David Letterman, and performed at the Sundance Film Festival. Enjoy this popular news story: Paul McCartney and Nancy show up to see James play, and surprise the small Brighton club audience. You might guess a band almost half a century old would be populated with superannuated blokes of yore. Ah, but there are no old guys in the Beach Boys. There were a lot of “old” baby boomer fans in the audience during Monday’s outdoor concert at Fairfield Middle School, but they were as uninhibited as any bunch of today’s teenagers ogling the Jonas Brothers. The Beach Boys, centered around originals Mike Love and Bruce Johnston, included lead guitarist and music director Scott Totten, keyboardist Tim Bonhomme, Randell Kirsch on bass, guitarist Christian Love — son of Mike Love — and John Cowsill on drums. Cowsill provided perfect surf drums for the two-hour concert, keeping many of the more than 4,000 concertgoers up and prancing the entire time. Those “old” folks did the Pony, the Swim, the Shimmy — long-forgotten go-go dances called up from collective memory by the jungle beat of surf music. Kirsch, who has the daunting job of covering Beach Boy guru Brian Wilson’s high parts, relishes his spot. “That’s the funnest job in the band,” he said. Iowa band The Nadas provided the walk-in music with a solid set of roots rock. “They were spot on awesome,” Iowa City musician Jason Bolinger said. The main show began when Fairfield Mayor Ed Malloy lauded Love with a proclamation, introducing the 68-year-old singer as “Fairfield’s Energy Czar Emperor.” The concert was a benefit for the David Lynch Foundation and the Fairfield Arts and Convention Center, as well as a kickoff for Fairfield’s new Green Sustainability Plan aimed at energy conservation. Love practices transcendental meditation at the Maharishi University of Management in Fairfield. MUM was founded by Maharishi Mahesh Yogi; the TM master was popular in the ’60s with the Beach Boys, the Beatles and other music and movie stars. “Little Honda” got things up and running. At least a few aging Boomers recalled that the song is about motorcycles, not cars. The vocals took a few songs to loosen up to the point of being totally tuned in and running smoothly, and that was OK — after all, the original band didn’t always hit all eight cylinders in concert. And it was good and swell that this band didn’t do a clone routine, a “Mike Love Karaoke Hour.” They did all Beach Boy hits — my, those boys had a lot of hit singles — and they were the Beach Boys, without the Wilson boys, sure, but a real band, not some broken-down fossil staggering around the stage with the rights to a band name and a cadre of grungy sidemen to prop him up. “Barbara Ann,” “Surfin’ Safari,” “California Girls,” “Surfer Girl,” “Sloop John B.” The concert list was seemingly endless. “Wouldn’t it be nice” was quite nice: “We could be happy,” the band sang, and the crowd sang with them, extremely happy to be there on a storybook Indian summer day in Iowa. Johnston’s lead vocals, especially on “Do You Wanna Dance?” were as clean and pure as any 25-year-old crooner touring today. Children frolicked with their elders. Beach balls careened in the sky. Souls soared. People grew younger with each new tune. The old people knew the song referred to Chevy’s 409 cubic inch V8 engine coveted by hotrodders of the era. It is not known how many youngsters present wondered why this legendary group was singing about bathroom cleaning products. All had fun yesterday in Fairfield, all but the police, who had nothing more to do than direct traffic for the polite, smiling concertgoers. Lynch Foundation Media Relations Director Ken Chawkin said the show was special for the band’s TM enthusiasts, especially Love. “This must be a huge thrill for Mike, because he’s been coming here for years to meditate and take rejuvenation treatments,” Chawkin said of Love. Perhaps that explains why there are no old guys in the Beach Boys. Love was not too worn out afterward to echo the enthusiasm of the well-wishers who surrounded him backstage. The event producer for the David Lynch Foundation, Michael Sternfeld, was as upbeat as everyone else at the end of the show. Yeah, man. Good vibes and a whole lot of fun.